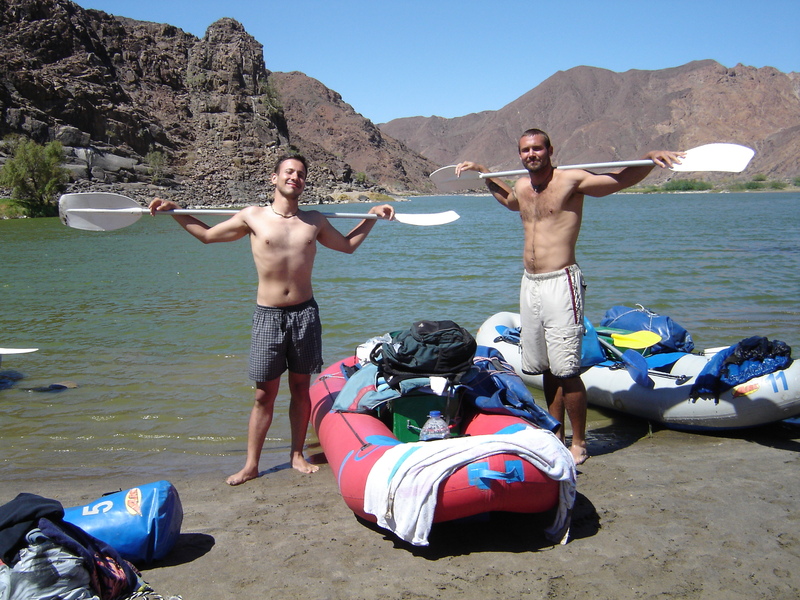 Join us on an unique unforgettable African Rafting Adventure on the Orange River (Gariep River). This river forms the border between South Africa and Namibia and runs through the breathtaking arid Richtersveld scenery. Under the guidance of experienced and qualified staff you will enjoy either a 4-day, 4-night or a 6-day, 6-night river rafting adventure not easily matched. Enjoy scrumptious meals, raging campfires and great company as you overnight under the starlit African sky. To top it all the water is warm and the weather naturally perfect ‘all year round’. The Orange River, South Africa’s largest river – rises in the Drakensberg range some 15 km’s south of Mont-aux-Sources and flows 2340km’s westwards until it reaches the Atlantic Ocean at Oranjemund. Arrival at the river (base camp) on the night before you set off paddling. You are welcome to arrive from 17h00 onwards. Please try be there by 20h00 as dinner is served approximately 20h30. Should your arrival be earlier or later, please inform the office. You will be woken at approx. 07h00 – coffee and tea will be available, followed by a briefing session for the mornings’ events. Breakfast will be served at 07h30. Packing procedure will be demonstrated and explained during breakfast. Safety speech will be delivered and demonstrated at approx. 09h00. You should be on the water no later than 10h30. Lunchtime will be at approx. 13h00, lasting for +/- 1hr 30min. Back on the water, river rafting until +/- 17h00. Once we arrive at the overnight spot you will have plenty of time to set up your sleeping area and settle in. Dinner served at approx. 20h00. Breakfast at 07h30, on the river by 10h00. Lunch time at approximately 13h00. Off the river around 17h00 and supper will be served at approximately 20h00.